A lot can be said about the neighborhood you live in. Many times the area that surrounds a home will determine if you purchase it or not when you are house-hunting. I just recently moved from a home in Aurora, Colorado (a Denver suburb of about 300 thousand people). The home was nice. It was built in the 1970’s and had four bedrooms, a nice office with french doors (that we installed) and a basement that we attempted to finish. The house was only a mile and a half from our training center, Denver Dog Works and about a mile from our kid’s school. There was everything to do in the ‘big city’ and I loved Denver (I still do and plan to spend a few months a year there). Those are the good points. The bad ones far outweigh the good. We had a Nazi HOA where people would literally drive around daily with a video camera taping your home. They would fine you if your “weeds” were too tall. The homes were on top of each other and you could ask your neighbor to pass the baked beans from your kitchen table if you were so inclined. You could only have three dogs and they had better not bark and we had a yard the size of a postage stamp. I guess thats why people to move to places like Alaska. It is still called The Last Frontier right? A place where a family can still move to breathe in the fresh air, raise your kids without the corruption of gangs (though I have heard there is a nasty gang problem in Anchorage) and go to a fireworks show where it looks like everyone in town, and everybody from within 50 miles, attends on a day that was not even a national holiday. Then there is the view I was talking about. Right out side of our (at least) 18 foot high windows facing to the north is the most magnificent view I have ever seen. It is of Mount McKinley. I have heard people say in Colorado that they would kill to have a view of the mountains, any mountain. Heck, even a foothill. 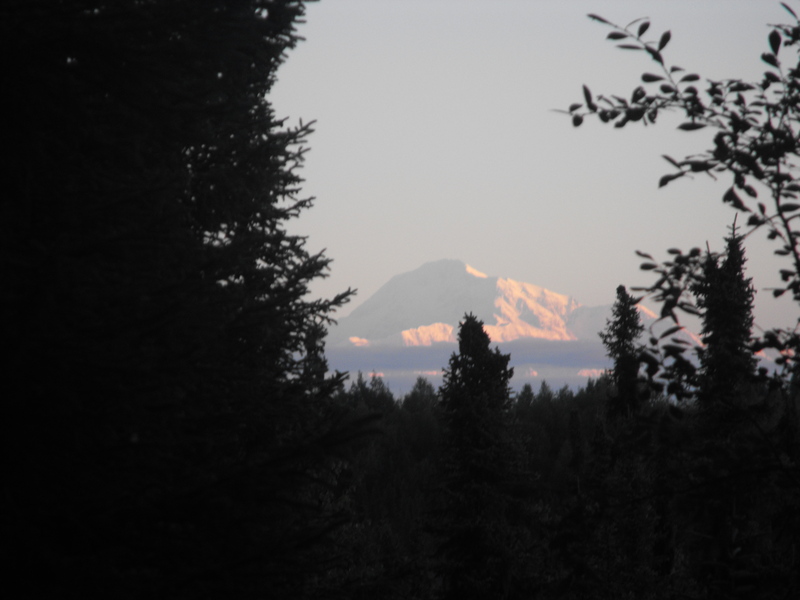 Denali is replete with snowfields which crown almost half of the mountain region. One can find innumerable glaciers in this region. Denali in local native language Den’ina, means “the great one.” The peak was first explored and scaled by Hudson, the American explorer in the year 1913. People who swear by Denali argue that the peak is higher than Mount Everest. They claim that since the base of Mount Everest, i.e., the Tibetan Plateau is about 17,000 feet; the vertical rise of the peak in actuality is about 12,000 feet. The base of Denali is a plateau measuring just 2000 feet which gives the peak a meteoric rise of about 18,000 feet. While our house is in need of major repair just to make it a home. It is our dream home in more ways that one. It is where we chose to build our dog team and build our future. If you are musher don’t you dream of having trail access right out your back door? In Colorado we had to drive for hours to find good snow, despite what the Coors commercials show you it snows very little in Golden, CO. A friend in California has to drive almost an hour to a snow-park where she can run her teams and she lives in a small town where temperatures can soar in the summer. Not to mention the people we have met from shop owners to neighbors have been so gracious and nice. In our neighborhood in Aurora I barely knew our neighbors. This home is going to be “the great one”. At least in our eyes. Its a far cry from upper middle-class, grid-lock traffic, hurry up and wait, would you like fries with that, I’ll have a triple shot with soy and leave room for cream but we love it!